Most families sign up for two or three full weeks of camp at a time. However, customizable schedules are available to all Champion families. Our registration form will allow you to specify any combination or duration of days at camp as desired. This flexibility will allow your family to create a "perfect fit" Champion schedule within the rest of your summer plans. At Champion, days at camp are purchased within "Plans". Each Plan is sold by the week and is specific to the child for whom it is purchased. *The prices listed above do not include discounts, extended care fees, or "Wild Wednesday" special event fees. The side bar to the right provides additional information on these items which may or may not apply to your situation. A 5-day plan automatically covers Monday through Friday for the week it is purchased (it cannot be divided across weeks). A family interested in a Mon, Wed, & Fri schedule for one week of camp and then a Monday through Thursday schedule the following week would need to purchase a 3-day plan and a 4-day plan respectively. Champion is pleased to offer 8 weeks of camp this summer, which are broken down into sessions. All weeks within a session have a unique set of games, special events, and contests, thus there is always something to look forward to. Click here for more information about the variety of weeks that make up a session. For those who are able to do so, we suggest signing up for a full session from start-to-finish to get best Champion experience possible. However, if your summer plans only allow a week here or there, we will be sure to make any Champion time your family can fit in as special as possible! 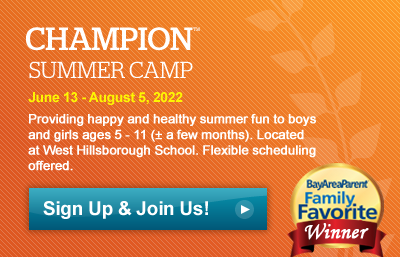 If you'd like to give your child several weeks of healthy outdoor activity this summer, we invite you to consider additional time at Champion. The Champion schedule was constructed with weeks in mind as opposed to days. Every session has a unique "personality", and we find that campers have just as much fun (if not more) on their second or third time through. Don't forget that you will save 10% on any extra time you sign up for through our Additional Plan Discount. You sign up for multiple weeks at camp. You sign up multiple kids for camp. You sign up multiple kids for multiple weeks at camp. The rate for this service is $1.50 per ten minute increment ($9.00 per hour) per child. Time will be tracked in ten minute increments and a bill will be sent to you at session's end. Families do not "pre-pay" for blocks of of Extended Care time. Instead families are charged only for increments of time actually used. This service is optional and can be used "On Demand" as needed. Click here for detailed information about these terrific camp events. Each Friday features a part fabulous and part fantastic camp-wide event designed to start your child's weekend with a bang! These special contests create a ton of excitement and include good old fashioned fun activities like hitting a counselor with a whipped cream pie or seeing who can launch a water balloon the farthest. A customized age and gender specific schedule that that features happy and healthy summer activity including sports, games, field trips, arts & crafts, theme days, special camp contests and more! A wide variety of sports, games, arts & crafts, field trips, and special camp contests gives Champion Summer Camp an especially unique camp format. Our diverse activities maximize fun and deliver a memorable experience to campers. Click here to see a list of activities offered at camp (under "Let's Play"). To keep all campers engaged, we customize each group's schedule by both age and gender. And while the schedule for 5 year old girls is very different from the one for 12 year old boys, both groups feel part of "something bigger" by being part of the unique camp environment we offer.